I have a quick request, after achieving Bronze with my new job (we travel in WTP thankfully), I am 260 tier points away from Silver. Now I am 99% sure I am going to Chennai in the next few weeks again in WTP which will get me 180 tier points. Leaving me 80 tier points short. I am looking for a cheap back to back or overnight to get these tier points. Any good deals going for this little amount, or what would you do in my shoes? MY card year ends 8th August. Hi samwilliams88, you haven't specified where you're based, but the following assumes you're convenient for Heathrow/Gatwick. As you only need 80TP and you've got some time left before your year end, I'd say you should take a cheap Club Europe return anywhere in the UK/Europe for a weekend at your convenience. Luxemburg is often cheap on weekend (I think a lot of the cheapest fares, regardless of destination, may mandate a Saturday night stay) - for example £86 each way on 7th-8th April. Check the BA Low Price Finder, set the duration to same day or 1 night and the cabin to Business, and take your pick based on the convenience of flight times, etc. There may be other options which are cheaper factoring in the overnight hotel, or that you're able to do in a day trip so negate the hotel. Edit: I've been beaten to it by two others… I need to up my game! Working back from those tier points I'm going to assume you're in the UK (London?). 80 tier points is a simple return flight somewhere nearby in CE - Amsterdam, Paris, Edinburgh, whatever. Pick a place you like and/ or the cheapest you can find for either a weekend break or a back to back and you're all set. Thank you to all three of you for the prompt replies. I am an hour/hour 10 from Heathrow which is quicker and easier than Gatwick. So I may look at Luxemburg as never been there before. But now you have pointed out so many options, hard to pick. Ideally, it would be a day trip, but an overnight wouldn't do any harm. The cheapest way I've got 80 TPs was buying B2B HBO singles LGW-AMS-LGW and then a POUG each way. Came out at something like £220 and no need for a hotel. I took the early flight and so was back at work before lunchtime. I did a night in LUX just last week to get me over the line to gold. A night was just the right amount and was very pleasent. Day trips to LUX, AMS or otherwise can be done but do cost a bit more without a Saturday night. Was there much to do/recommend for the day and night? I went there with missus and 7yr old and I'd say there's just enough to keep you occupied for a day, but I'm quiet easily satisfied in any foreign city. The town centre is tiny, maybe 2 streets up and 2 across. Bit down the valley is supposed to be nice but we didn't have time. Think you should easily be able to spend a few hours down there. If you haven't been then I think its worth going for a night. If you have, then something like AMS would be more interesting. And of course LHR-LUX goes from T3 which is always nice. Trying to recreate this for a trip around September 4th-9th, never used Matrix only google and AA multi-city. 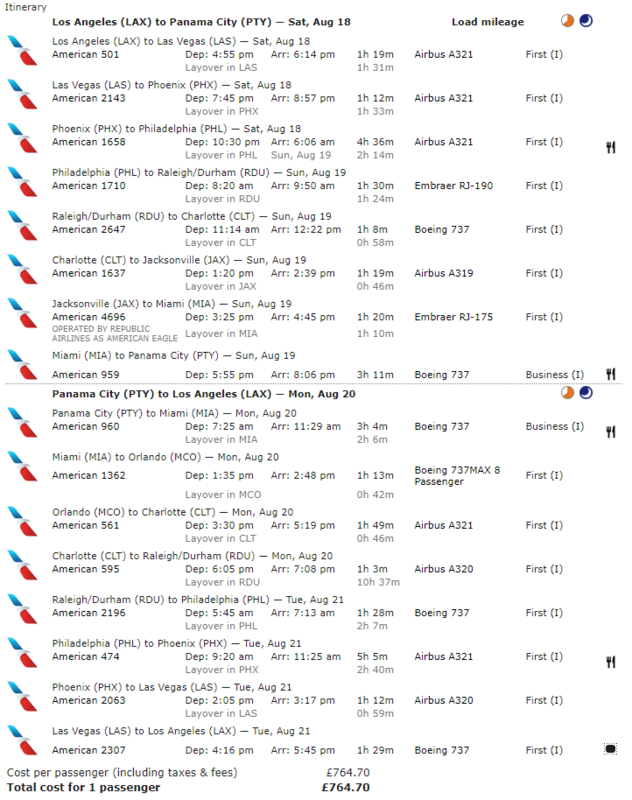 I have copy/pasted the routing and filled out the boxes with the same information but I am just getting 'no flights available' any help appreciated. Firstly, I would check that the flight numbers correspond to the days that you are actually wanting to fly. It could be that the above flight numbers only operate on certain days if the week or have different times on different days. I’m afraid you may need to do some leg work first to get what you are after. Edit. Ross did post a follow up on this at some point so it’s worth checking. rossmacd and MANtraveller like this. @MANtraveller I've literally just copied the routing given by rossmacd in the post you have quoted and it did price up on matrix. Then select business as cabin. This brought up various options which you can then explore in more detail. I would also remove specific flight numbers and just put "AA " before the list of cities. I realized that sometimes removing RDU helps the search, but that'd give you 40TP less. Thanks guys - I changed LA (all airports) to LAX specifically and added +/- 2 days and woo hoo !! rossmacd and l31g like this. I've been monitoring this cheap CE fare and you can throw in a 5* hotel pretty cheaply. There's an early Saturday flight and evening Sunday flight so it works out really well as a nice weekend luxury break with a few Avios and TPs thrown in for good measure.